Legions of Superfriends - this week's blog looks at character dynamics in a team comic. That's a very interesting blog, Dr. Mike! The inter-connectivity of relationships in teams and how they differ from a comic with a single, titular character is a very interesting subject, and I found it funny and neat that you pointed out that groups of three typically deal with the "weird" stuff and groups of four are very family orientated. I never noticed that, before. Also, this is really nerdy, but I really liked the little formula that you had about the number of relationships in a group. I forgot to point out that to write the Legion of Superheroes fully with 30 members, you'd need to write 435 conversations! Yeah, I was surprised by the threes and fours. I wasn't really looking for that, but when I added the Ghostbusters as a trio it really popped out. Teams of three are always "scientists of the strange"
Flying Solo - this week I talk a bit about solo stories, and give in to my base urges and wax lyrical about how great Doom Patrol was. Watch this space for actual comics! 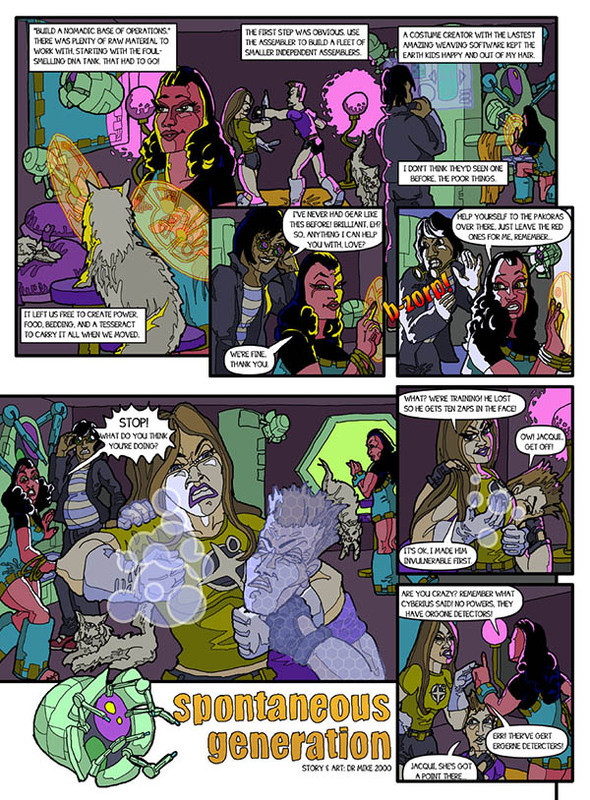 I've got a short story featuring Venus Green coming out this week on a friend's Tumblr, and another seven pages of Universe Gun to go up next weekend! Doc, your topics are always intriguing to me. I have to find a way to make time soon to catch up on your stuff! 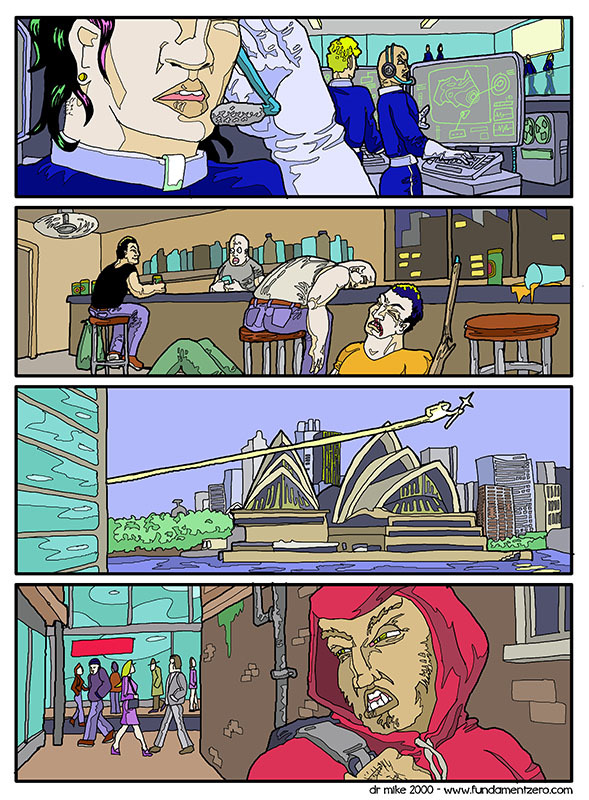 I started the blog just so I'd have something to post between updates to the comic, since they're 8 weeks apart. I honestly thought I'd have run out of things to talk about by now, but no such luck. I honestly thought I'd have run out of things to talk about by now, but no such luck. Don't worry about that, Spydey! I've got Amazing Stamina and Super Windbag Breath! Having said that, there's no blog this week, just an new chapter of Universe Gun! 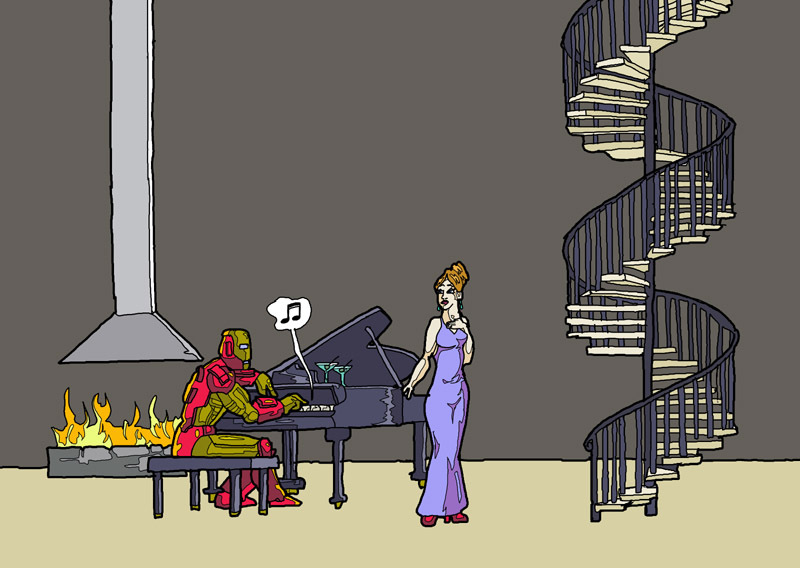 Things get a little steamy over at www.universegun.com in the latest chapter: Real Life! Another week goes by, and I'm back to work on Universe Gun after a brief hiatus to do side projects. Its good to be back! 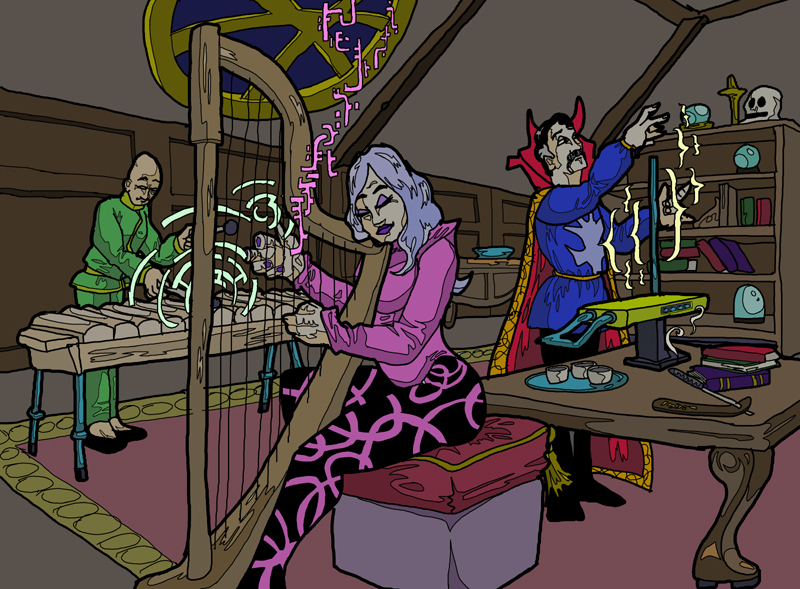 And there's a new blog entry up at www.fundamentzero.com, where I discuss how to introduce a cast of characters to the reader. Snowballs, Bombs and Legion Dog Tags awaits! What are Martian princesses made of? Sugar? Spice...? Surely not! Uncover the shocking truth in my latest blog at www.fundamentzero.com as I go over the history of the ideas that eventually became Princess Amtora. 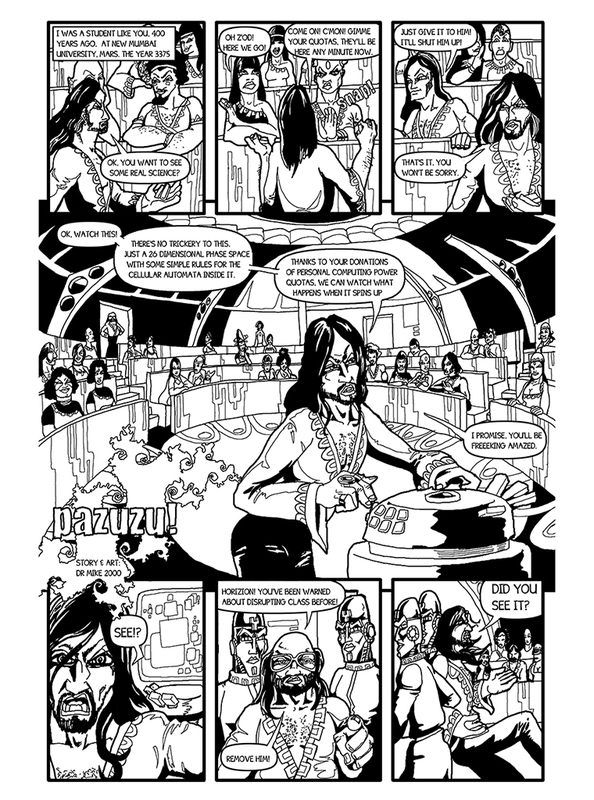 Indie Comics Quarterly #1 is available for sale, featuring Pazuzu!, my 9 page black and white strip about fractal genies, soaked in 1970s fashion! 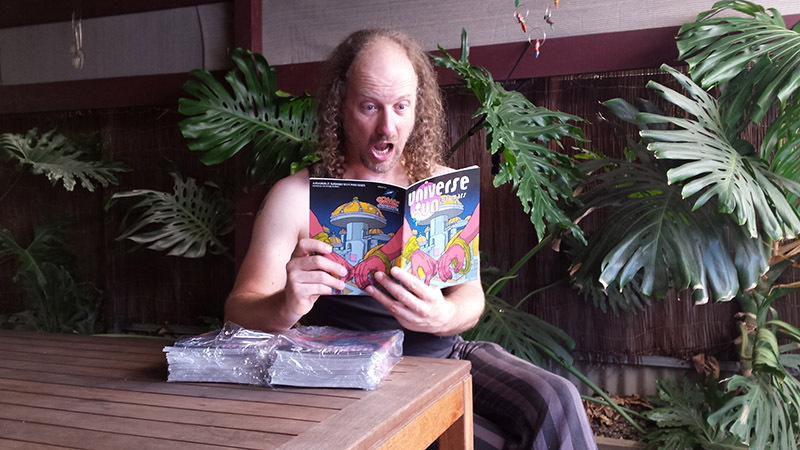 Go to www.indiecomicsquarterly.com to buy a copy of this lovely squarebound anthology that's full of cool strips! As a bonus, I've got a page of Universe Gun hanging in an art gallery? Agar Agar? What kind of name is that? 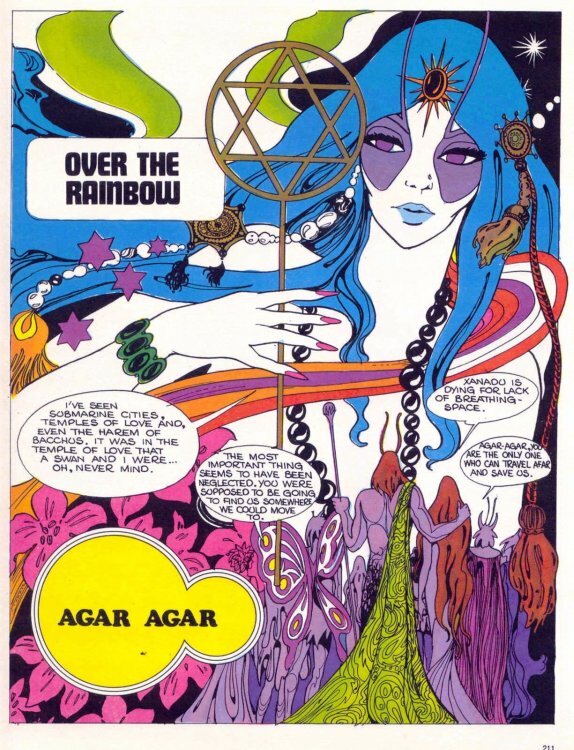 Learn more about this vintage psychedelic comic strip at www.fundamentzero.com, as I take a brief break from talking about Universe Gun to look at some old European material that crossed my path recently. Last week, I discussed Computational Substrate - how computers work today and what they might do in a sci-fi future! This week, I take a look at continuity, brought on in part by my contribution to the relaunch of Australia's Southern Squadron with this pinup. And this is what it looks like (if I remove lettering and only show one panel per page! Come back next week for the final chapter of issue 2. I'll finally get down to the serious superhero business of running around in underwear whilst punching robots and buildings in two! Action! Buildings getting twisted apart and robot getting punched in the head! Last week's blog: the first in a series discussing Alternative Superheroes, and the original alternative hero Wonder Woman and her legacy. 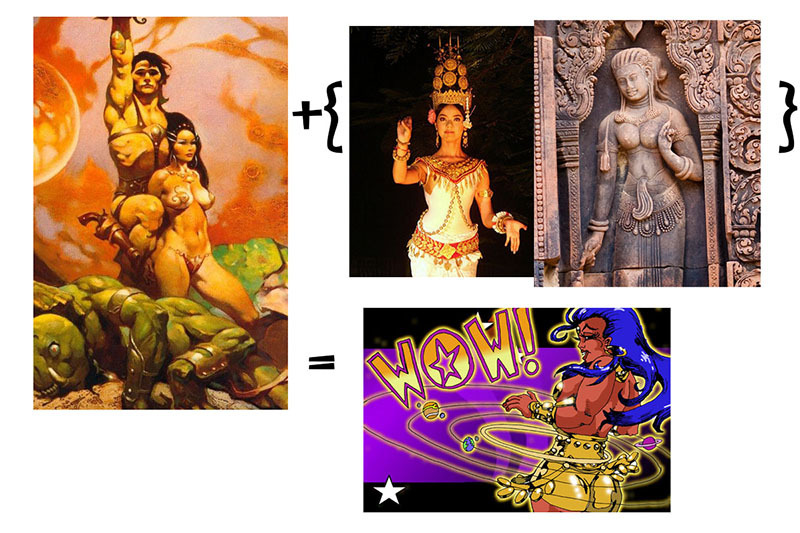 This week: Wonder Twins - my thoughts on diversity and a bit of physics as I put Star Girl 3000 and Coriolis Boy under the microscope. Universe Gun #3: Earth kicks off today! 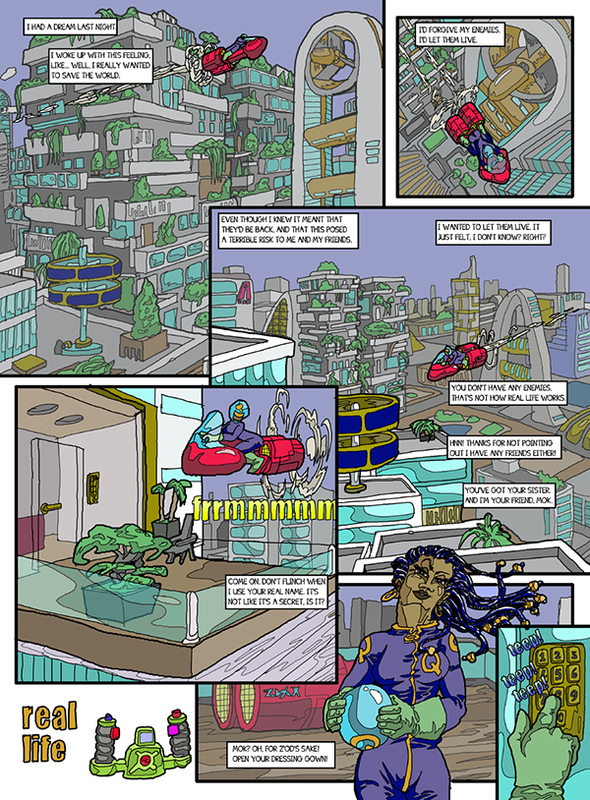 Ms. Amazing, the artificial intelligence called Cyberius XII, and the 21st C collide in a chapter called What Am I? Love your art style. I finally got your mod (I'm a slowpoke, what can I say? I still haven't even owned a game system newer than the Gamecube) and spent more of the time looking at your works on your site. Love the specific inspiration. Your one of the people I've run across and I mean this authentically that any comic company publishing right now is at a loss for not having found you into their bullpen as are the readers. I'll take this over at least half of the stuff in print right now. It's fetching and breathes most importantly rather than just being representation and therefore 2-dimensional. It's wonderful to hear that someone "gets" my work, and that it resonates with you. Go to www.fundamentzero.com to read my thoughts on conveying sound in a purely visual medium. 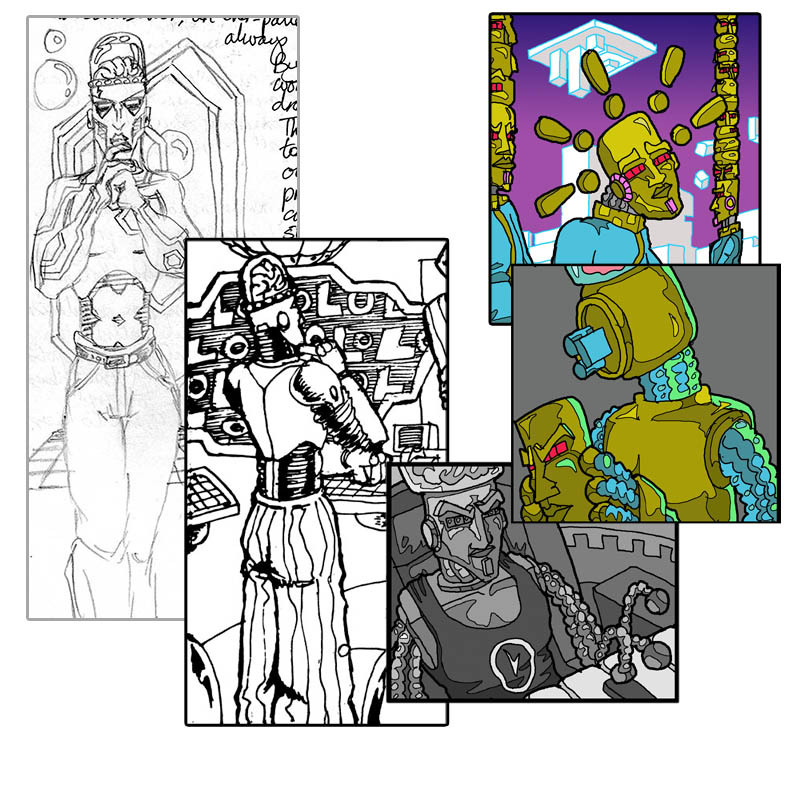 Why does this reformed genocidal android keep recurring in my comic strips? Read my confused thoughts at www.fundamentzero.com as I delve into the secret history of Cyberius XII! My pen-name's now 15 years out of date! Can you believe it!? Congratulations on a productive year, Doc! Looking forward to more of your work in '15! Thanks, JK! I shall endeavour to deliver! 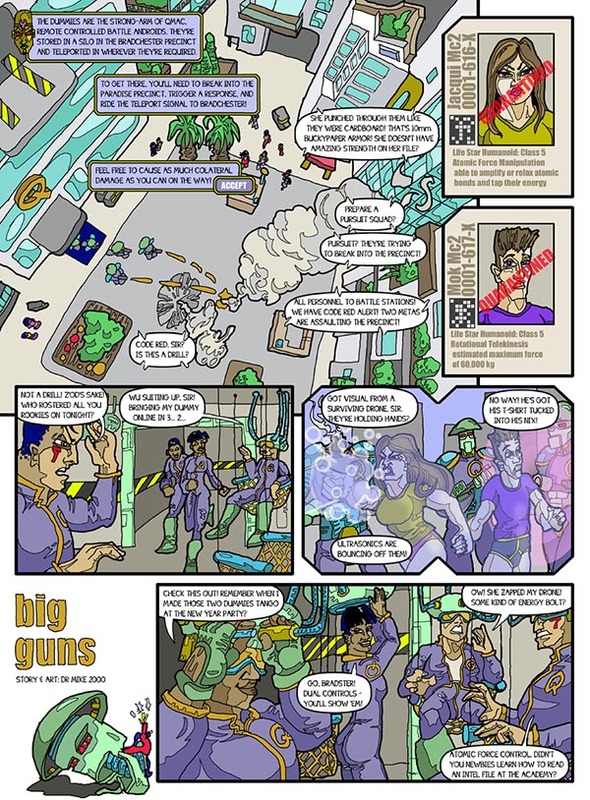 A new chapter of Universe Gun is up at www.fundamentzero.com today! I really love this Dr. Mike. Aww, thanks, Ant! That means a lot to me. Yeah, I feel like its just hitting its stride now with the published pages (I'm always surfing 21 pages ahead of you) mainly because I've got the team together and interacting now, and that's always been one of my favourite things. Set up the big cosmic scenarios, but then watch people still act like people while facing it. Anyway, today's blog, celebrating a year of writing these blogs and publishing artwork and so on, is all about classical music, highbrow vs lowbrow culture, and the movies of Ken Russell! Yes, printed copies! As you can see, I'm as surprised as you are! I've run up a small batch for the local convention circuit this year.